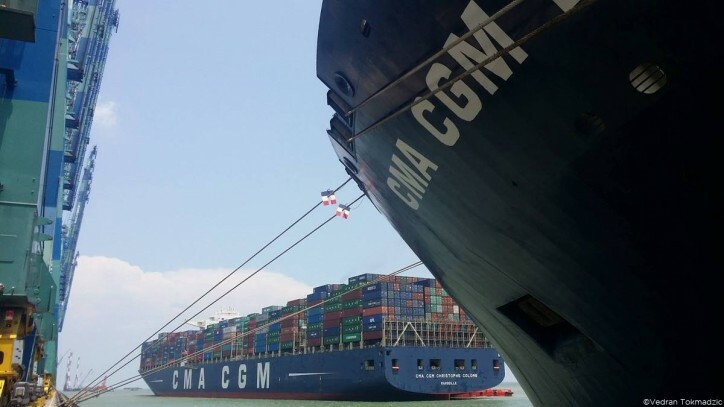 The CMA CGM Group announced last week that on July 25, 2017, the official signing ceremony for the concession agreement of the new container terminal was held in Kribi, Cameroon, chaired by the Minister for Transport, Mr Edgar Alain Mébé Ngo’o. Following an international call to tenders, the consortium of the French groups CMA CGM and Bolloré Transport & Logistics as well as the Chinese group CHEC, were granted the funding and the operation of the Kribi Container Terminal, which they will manage for 25 years under a Public-Private partnership with the State of Cameroon. Kribi Containers Terminal will be backed by a solid and complementary shareholder base: CMA CGM, which ships more than 35% of containers from the West African Coast and operates over 30 terminals worldwide, Bolloré Transport & Logistics, which has been operating in Africa and Cameroon for over 50 years,; the Chinese CHEC, a renowned builder that is highly active in infrastructure development in Cameroon, and private reference Cameroonian operators that want to support the project. Today equipped with a 350-metre-wide, 16-metre-deep dock, the Kribi terminal can host ships of an 8,000 TEUs capacity. In phase 2, Kribi Containers Terminal will operate 11,000 TEUs vessels. It will have a 715-metre dock, 32 hectares of open ground, and the capacity to process 1.3 million TEUs. The infrastructure and equipment comply with the best international standards. The latest dock and yard gantry cranes will be put into service in the coming weeks so that operations can get started rapidly. Kribi is a strategic location to reach all of Africa’s Atlantic coast and Hinterland countries. Ideally located in Cameroon, a growing market, this terminal is a logistical hub, offering the Cameroonian supply chain a modern infrastructure, adapted to the new generation of ocean vessels and as well as allowing all of Western Africa to redirect containers toward countries of the Sub-Region. With the new Port of Kribi, Cameroon now has a second portal hub to add to its network of infrastructures. It is a considerable contribution to speeding up Cameroon’s economic and social development. Connected to the city of Edéa, the Port of Kribi is a major asset for the country and will permeate the region with new logistical gateways through its direct connections with landlocked countries, such as Chad or the Central African Republic. Kribi Container Terminal will complement the services offered by the Port of Douala. Together, both ports will facilitate growth in regional trade. The Kribi Terminal will create nearly 300 direct domestic jobs.